Vectra Genisys is the first modular therapy system that consolidates up to six therapeutic modalities in one system, at a fraction of what these modalities would cost alone. 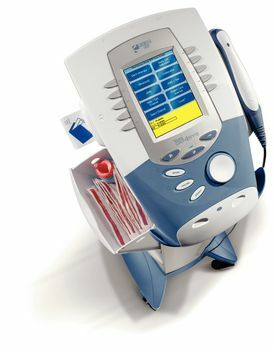 Unique modular design lets you choose what fits best in your clinical setting now or easily add to later without the replacement of products. Do you prefer in-depth customization or simple preset controls? Now you can have both. If you’re a therapist with a knack for technology, you’re going to love the Vectra Genisys. Feature rich software and advanced engineering give you direct control over multiple parameters so you can program treatments to meet even the most complex challenges. And the on-board Graphical Library can help you educate your patients. If you’re a therapist who likes to simplify treatment setup, our user-friendly interfaces and intuitive on-board software provide you with the ultimate in ease of use. In fact, most therapies can be started in just a few steps. With six seamlessly integrated modalities under one roof, (ultrasound, electrotherapy, ultrasound/ electrotherapy combination, laser, sEMG, and sEMG + stim) your choice of therapy is now available from a single system. Don’t need all of these treatment options right away? No problem. The Vectra Genisys’ sleek modular design lets you simply add them on later. Modularity doesn’t stop with the unit. All ultrasound and laser applicators are interchangeable and feature Electronic Signature™ for automatic recognition by the unit. Simply plug them in and go. Additionally, ultrasound applicators have a head warming feature for patient comfort and are waterproof for underwater treatments.